The Atacama Rally, third round of the FIM Cross-Country Rallies World Championship, kicks off this Monday with the curtain-raiser – a short prologue stage that will determine the competitors’ starting order for the first full stage. A buoyant Monster Energy Honda Team is all set and poised to take up the action. 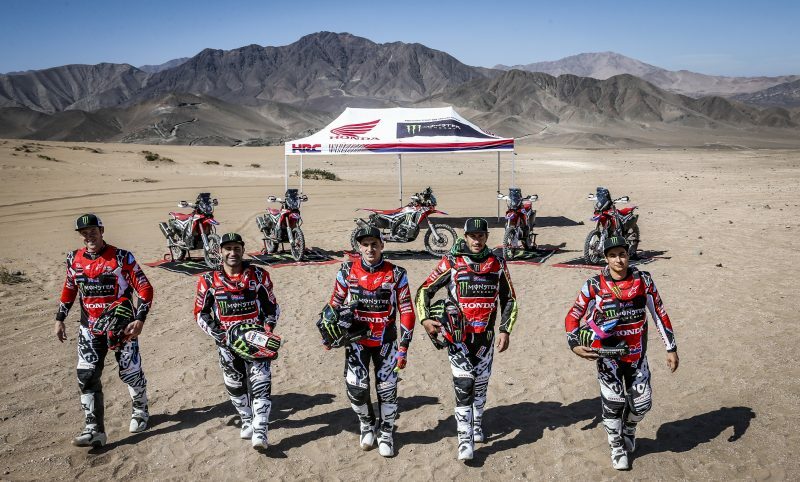 After making the first contact with Chilean terrain and overcoming the mandatory administrative and technical checks, Monster Energy Honda Team is hot to trot for the Atacama Rally which gets underway tomorrow, Monday, at 17:00 hrs (local time in Chile, GMT -4). The squad made up of Kevin Benavides (Argentina), Paulo Gonçalves (Portugal), Ricky Brabec (USA), Joan Barreda (Spain) and local rider José Ignacio Cornejo, will dispute the short 2.5-kilometre prologue in Tierra Amarilla, near Copiapó, where the opening ceremony will also take place. The result of the prologue will be decisive in establishing the starting positions for the first full Atacama Rally stage. The top finishers will be able to choose their positions – the fastest rider being the one who gets to choose last – for the starting order of the stage held on Tuesday August 14. The full stage will run from Copiapó-Copiapó, covering 358.87 kilometres, including a total of 266.30 kilometres of timed special. The championship has restarted and I am very happy and motivated for this second part of the season. We now have two hectic months with four races: Atacama, Ruta, Inca and Morocco, but we are focused on fighting for the world championship and performing each race well, step by step. I will try to do my best, but also try and feel good with the bike and enjoy ourselves as a team, which is doing a great job and has prepared very hard to face these latest dates in the calendar. After a good break in the championship, we return to competition in South America. The team has worked hard during this time. I have also prepared myself physically to be able to continue fighting for what is left of the world championship. We are going to take it one step at a time as we still have some preparations before we reach our main objective. We will try to give it everything. Here we are in Chile with the second half of the season about to start up. There are some pretty big dunes here and I’m excited to start racing. We’ve been a long time at home with a lot of time on holidays but we just did some testing in California which was awesome. The team is out here shaking down the bikes. Everything is good so far, so hopefully we will have a good week. Let’s hope the riders stay strong and healthy. We are a day away from starting the Atacama and I am very motivated with the home race. We have prepared the bikes and everything is all set to start tomorrow. We have trained a lot over the recent months since the last competition and I feel really good. The objective is to do better than in the last edition and to do my best day by day and ride an intelligent race. For me it is an important race, my second race of the year, after a good start in Merzouga. I have recovered well and I feel in good shape, with very good pace. At the same time, we will have to be careful, as the aim is to accumulate kilometres in these upcoming races that we are competing in: Atacama, Inca and Morocco. We will try to use a good strategy, we know it will be a complicated race with very close times, but we will look to set the pace and play our cards correctly.